Looking from Buchan Burn towards the rugged hill of Curleywee. 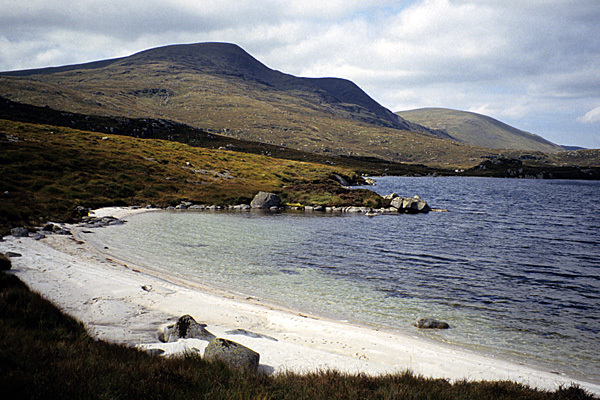 The Merrick, the highest of the Galloway Hills, seen from the shore of Loch Enoch. 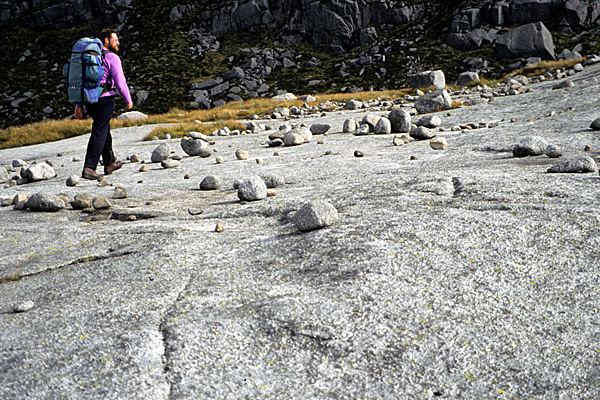 Paddy Dillon walking along the curious De’il’s Bowling Green in the heart of the Galloway Hills. A casual suggestion from Cicerone led to a prolonged and strenuous exploration of the broad, bleak, boggy, rocky Galloway Hills in South West Scotland. The route research was accomplished a bit at a time, a week here and there, stretching from winter into summer. Accommodation was usually in remote mountain bothies, or by establishing wild camps in the hills, while the walks were tackled day after day, sometimes without setting foot on tarmac for a week. A sudden fall of deep snow hampered the route research in the winter, while annoying plagues of midges made it difficult in the summer, but eventually it was all completed. 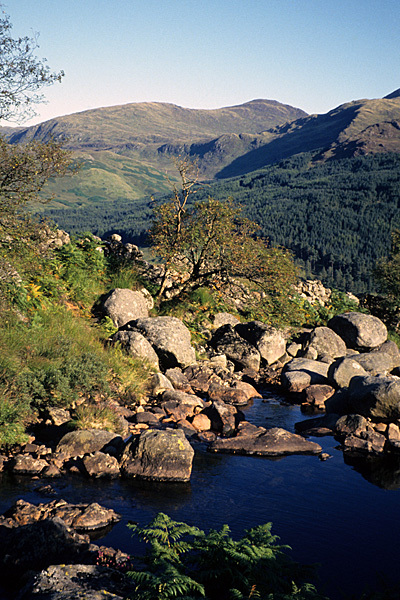 The routes venture deep into the Galloway Hills, where walkers often need to be self-sufficient, as well as being good navigators. 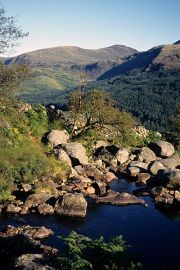 The terrain is notoriously rugged, while the placenames of the region are amazing - Curleywee, Mullwharchar, Craigeazle, Shalloch on Minnoch, the Range of the Awful Hand, the Dungeon Hills, and many more. Harvey Maps offered the use of their detailed Galloway Hills map when they heard about this project, so extracts from their map appear throughout the book. That contact led to another small project, as the Galloway Hills map needed a new Visitor Guide to be written and illustrated, for distribution with the map. Walkers please note that Caldons Campsite has closed.